Skip the long ticket lines and gain priority access to the Vatican Museums and the Sistine Chapel with these tickets. Explore the ancient halls of the Vatican Museums and discover some of the greatest works of Renaissance art - from the monumental Gallery of Maps to Michelangelo's masterpiece on the walls of the Sistine Chapel. Benefit from priority access and bypass the winding ticket queue to make your way to the intriguing Vatican Museums and explore the Pigna Courtyard, Pius Clementino Museum, Chandelier’s Gallery, Tapestries Gallery, Raphael’s Rooms and many more! You will also get the chance to marvel at the breathtaking murals that adorn the walls of the world famous Sistine Chapel. 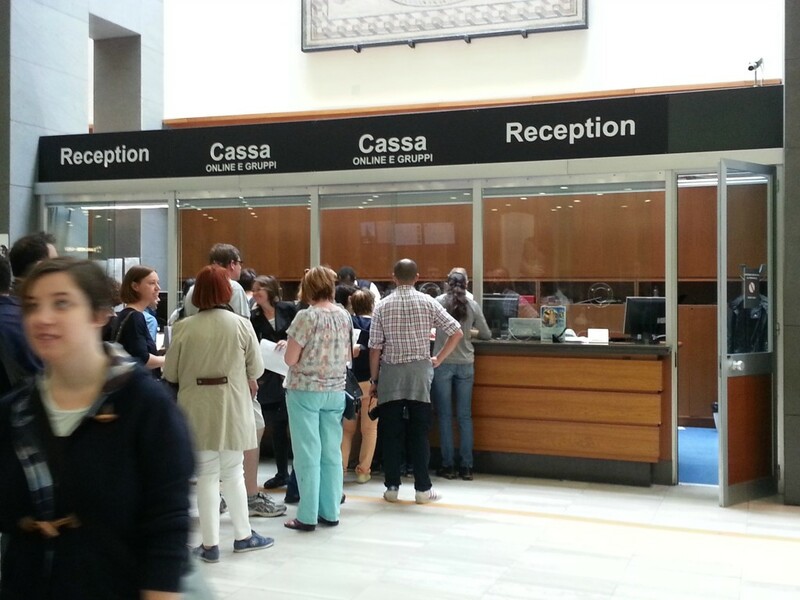 On the day of your visit, head to the Vatican Museums with your mobile voucher and display it on your phone to the security guards and after the security check, scan your voucher at the CASSA ONLINE E GRUPPI, the Vatican ticket office at the museums. Once you have scanned the voucher and received the tickets, you are free to explore the Vatican Museums and Sistine Chapel for as long as you like. The Vatican Museums are home to a number of classical sculptures, tapestries, and paintings by Renaissance greats such as Raphael, Caravaggio, Michelangelo, Bernini, and Leonardo da Vinci. A section of the museum is also dedicated to Modern Religious Art. Paintings and sculptures here come from artists such as Vincent van Gogh, Paul Gauguin, Salvador Dalí, and Pablo Picasso. The iconic sections of the Vatican Museums that one should visit are the Raphael Rooms, the Gallery of Maps, the Sala Rotunda and the Gallery of Statues and the Hall of Busts. Situated at the end of the Vatican Museums and neighboring St. Peter's Basilica is the famed Sistine Chapel. Built in the 15th century, its walls and ceilings are covered by some of the most astounding frescoes ever produced. The ceiling of the Sistine Chapel is especially famous. Painted by Michelangelo in a span of 4 years, the frescoes of the Sistine Chapel are considered to be a cornerstone of western art. The Last Judgement covers the wall behind the altar and is probably the most famous single work of art in the Sistine Chapel. Skip the Line tickets to the Vatican Museums. Skip the Line tickets to the Sistine Chapel. The Vatican Museums and Sistine Chapel are open from Monday to Saturday - 9.00 AM to 6.00 PM. Sundays are closed, except for the last Sunday of every month. Open hours for every last Sunday of the month is from 9.00 AM to 2.00 PM. Access to St. Peter's Basilica is free but there could be a waiting line during peak season. Children between the age of 6 to 18 and including 18 are eligible for reduced prices. Please select "Child" option on the last page. Students below the age of 25 are eligible for reduced prices provided a valid student ID or a valid International Student Card is presented at the time of ticket collection. Please select the "Student" option on the last page. The closest station to the Vatican is the Ottaviano-S. Pietro station. Line A of the Rome Metro stops at this station every few minutes. The Museum is a 5-minute walk from this metro station. These tickets cannot be canceled. Reschedules are possible subject to availability. 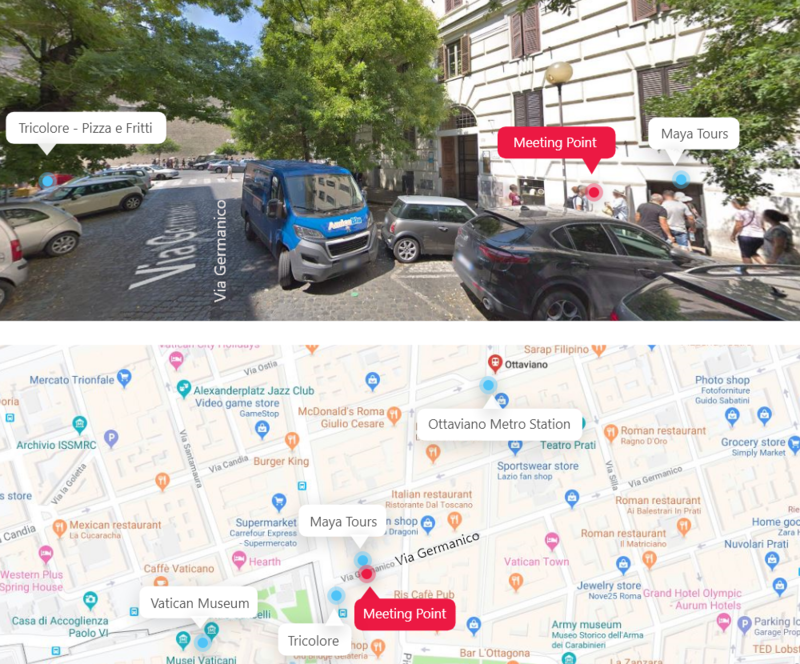 You have to meet your host at the meeting point located at Maya Tours Office Via Germanico, 16, 00192 Roma RM, Italy. This point is 2 minutes away from the Vatican Museum entrance.